Columbia is well-known for quality yet affordable winter boots. 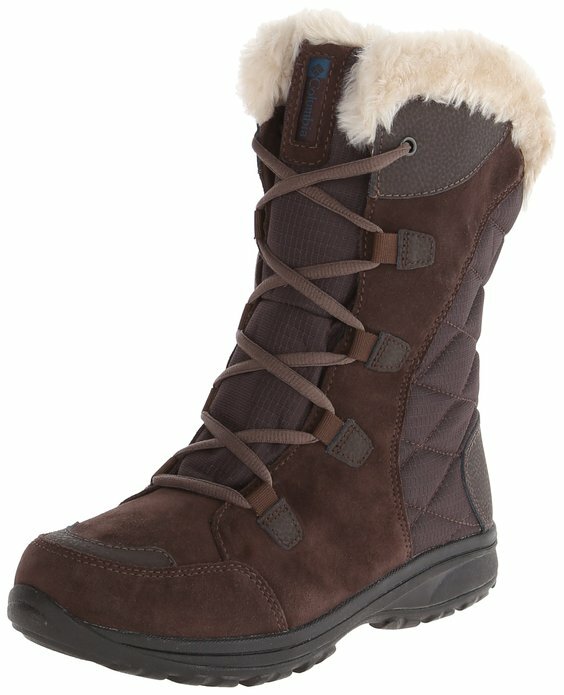 And the popular Ice Maiden II winter boot for women is no exception. Generally priced less than $85, the Ice Maiden provides an excellent blend of warmth, function and style. The Columbia Ice Maiden II. Good traction, waterproof and warmth make it an excellent boot for most winter weather conditions. More info at Amazon. One of the more important functions of a winter boot is to provide traction in slick conditions. The Ice Maiden II satisfies this condition. The boot utilizes a specialized non-marking compound called Omni-Grip. Omin-Grip is a winter-specific lug tread pattern designed to provide maximum traction in the snow. The upper of the Ice Maiden II is somewhat unique. It combines a woven synthetic textile upper that is fully waterproof with a suede overlay. The suede itself is not waterproof. Instead, the synthetic textile upper membrane provides the waterproofing. The Ice Maiden utilizes a specialized and proprietary insulation for the boot. The boot has a temperature rating of -25 degrees. However, like all winter boots, to achieve that rating depends on many factors - not the least of which is that a quality winter sock is worn. The Ice Maiden II does have a snow-gaiter, which consists of faux-fur. However, the gaiter is more "form" than "function." While the gaiter will prevent some snow from falling into the boot, the gaiter is no substitute for a genuine snow gaiter. For most activities, the Ice Maiden's gaiter will work fine - especially since the boot has a 9" shaft height. However, if you plan to wander through deep snow, either consider a different type of boot or buy a genuine snow gaiter. One of the largest advantages of the Ice Maiden is its surprising lightweight. A pair of boots (depending on size), tops the scale at just over a pound. This lightweight is made possible by the lightweight suede upper and the bottom that is constructed of Tech-Lite (which weighs significantly less than rubber). The advantages a lightweight boot provides is obvious. The boot works well for everything from taking long winter walks, commuting to work or just shoveling the sidewalk after a fresh snow. Overall, the Columbia Ice Maiden II is an excellent winter boot for many winter activities. It's warmth, excellent traction and stylistic looks allows the boot to be used around the yard, a night out on the town or at work. Just remember that the Ice Maiden II isn't a true snow boot (read article about difference between snow boots and winter boots). If you plan to play in deep snow, you'll either want a dedicated snow boot (such as those made by Sorel or Baffin) or a separate snow gaiter. Offline, Columbia Ice Maiden boots can be difficult to find. Some department stores carry them, but popular sizes are often limited and it's rare for a store to have the full compliment of colors available. Online, many retailers carry the Ice Maiden. In particular, Amazon usually has most sizes and colors in stock, with the best prices you're likely to find online. If Amazon is out of stock of a particular color or size you need, another excellent place to find the Ice Maiden II is through Columbia itself. Zappos - Another excellent place to find this boot. Generous return policy and fast shipping, too. Temperature Rating : -25 degrees. Colors Available : Change yearly, but colors often include Cordovan/Siberia, Shale/Dark Raspberry, and Black/Columbia Grey. Weight : 1 lb 1 oz (per pair). Snow Gaiter : Yes - a moderate fuzzy fleece gaiter. Bottom : Omni-Grip non-marking outsole, with lightweight Tech-Lite mid-sole. Upper : Synthetic textile upper with suede overlays that is fully waterproof. Sizes Available : Whole and half sizes for women, ranging from 5.5 to 12.